In the twenty-first century, public health is everyone’s business. The nursing and medical professions are well placed to provide advice to their clients, especially in respect to lifestyle change, and public health initiatives are supported by a range of statutory and voluntary organisations and health workers, ranging from health promotion specialists to smoking cessation advisers and nutrition assistants. Designed to help readers develop the practical skills they need to become effective public health practitioners, this concise text gives an easily digested overview of public health and health promotion theory in accessible language and diagrams, before moving on to the ways readers can apply this in practice. Outlines the roles of specific organisations involved in the work of public health work. Covers health needs assessment, agenda setting and the technical aspects of how to research plan and evaluate effective practice either with individual clients or when devising programmes and initiatives for population groups. Details methods of helping people with motivation for lifestyle change, building rapport, ongoing support, monitoring and signposting to specific services. Discusses role of neighbourhoods and communities in improving health and how workers may support local populations to improve the health of their community. 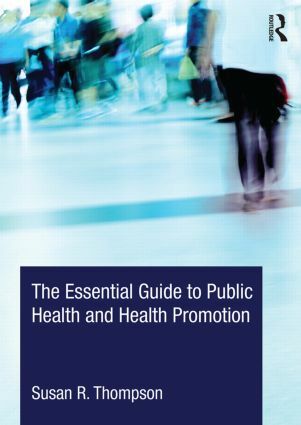 The Essential Guide to Public Health and Health Promotion is an accessible introduction to the principles and practice of health promotion and public health for all those new to working or studying in the area, whatever their professional background.